Under this menu you can load or save your settings, define your preferences and check your setup. When you load an application setting, the current settings are overwritten and lost. You can export different setting for different setup. 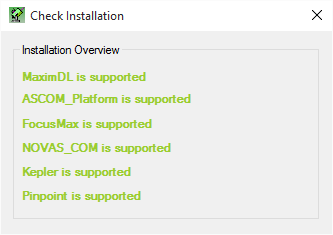 The application settings has no influence on Maxim DL, if you want to use an other configuration of maxim DL (in order to use an other scope or camera etc…) you have to change the configuration in Maxim DL. With this tool you can verify that the connection to your hardware works well, the unused hardware remain black. This animation display what happens when Astromatik is not able to connect to the telescope. In this example, the user has to double-check the telescope connection in the ASCOM interface (only POTH and generic HUB are supported).